Born Kim Suellen McConnell in Vancouver, British Columbia, Kim grew up drawing and painting the animals and landscapes around her coastal homes along BC's rugged coast. After high school Kim enrolled in a two year graphic arts program offered by Douglas College in Vancouver, BC. Upon graduation, Kim accepted a graphics artist position at the Broughton Group in Victoria, BC and spent 7 years working for several design agencies in the provincial capital. During this period she also participated in fine art group exhibitions where her natural drawing and painting abilities were displayed. She also became increasingly sought after as a commercial illustrator. In 1987 Kim married illustrator boyfriend, Lars Justinen and moved to Nampa, Idaho where Lars worked as an illustrator for Pacific Press Publishing Association. Over the next few years Kim illustrated several large projects, including a 3 volume medical encyclopedia, and numerous children's books and magazines. In 1991 she and her husband started their own illustration/graphic arts company, Justinen Creative Group (www.jcg.com). In 1994 and 1996, Kim gave birth to a baby boy and girl, Stephen and Hannah. Their company grew to include the largest religious image licensing (www.goodsalt.com) in the world, website development and online training. 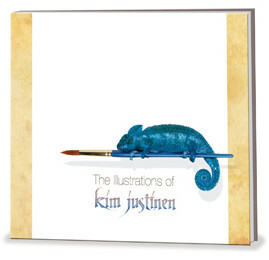 Over the years Kim has become one of the world's most prolific children's book and magazine illustrators. Her many illustration styles have often been described as chameolon by the designers and editors that use her talents. In 25 years of illustrating, she has had over 18,000 original illustrations published, some of which are showcased on this site. Today Kim and her husband live near Vancouver, British Columbia, and summer in a small beach cottage on the northwest tip of Vancouver Island where they run their Idaho companies via satellite internet.